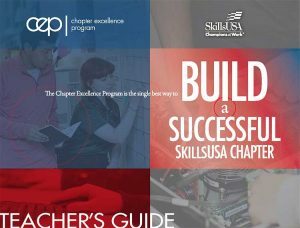 The Chapter Excellence Program (CEP) is the single best way to build a successful SkillsUSA chapter! To learn more, check out the information below. CEP recognizes achievement as it relates to the integration of the SkillsUSA Framework in chapter program of work activities. As a chapter’s yearly action plan, the program of work is at the heart of student learning and employability development. By using the Framework as a guide, chapters have a blueprint for creating relevant activities that encourage participation and foster an understanding of student learning attained during each activity. The Framework’s focus on intentional learning turns the program of work into more than just a planning tool. Using the Framework, the program of work becomes the vital conduit that links students to the application of personal, workplace and technical skills demanded by industry. 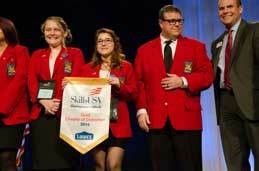 The SkillsUSA trifecta for student success! Within the personal, workplace and technical skills areas, there are specific Essential Elements tied to each. The Essential Elements are high-demand employability skills as defined by industry, and the benchmark for measuring student success during an activity. If students learn the Essential Element of responsibility during a personal component activity, the Framework requires that a chapter be specific regarding the how and why students learned responsibility. This conscientious approach gives added meaning to the valuable experience gained by students in the planning, organization and implementation of activities. 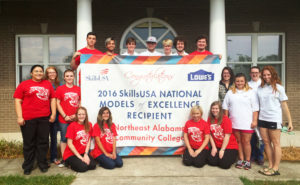 Most importantly, this approach actualizes SkillsUSA’s mission to “empower members to become world-class workers, leaders and responsible American citizens” on the chapter level. Why get involved in the CEP? What Must Our Chapter Do to Earn Level 1 Quality Chapter Award? What Must Our Chapter Do to Earn Level 2 Chapter of Distinction? The CEP rubric offers specific information to help support a fair distribution of points. What Must Our Chapter Do to Earn Level 3 Models of Excellence? The National Models of Excellence award is the highest honor a chapter can receive. What do CEP award recipients receive? Use this sample application as a guide to completing your application. The blank application is available as a word document so that students can work on their project goals, action plan and evaluation prior to completing the online application. Spell check and ensure grammar is correct in the word document first, then copy and paste the contents into the online application. Download the Completing Online Level 1 Quality Chapter Application presentation. Download the Completing Online Level 2 Chapter of Distinction Application presentation. Download the Chapter of Distinction Rubric. Download the 2017 Best Practice Guide. Download the mini lesson plans. Download the CEP Teacher’s Guide. Download the sample Program of Work. 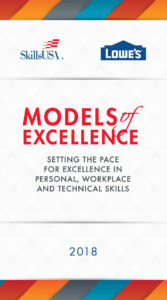 Click to download the Models of Excellence best practices book.